Carpal tunnel syndrome (CTS) is the most common compressive neuropathy in humans. It is related to a focal compression of the median nerve in the carpal tunnel due to a local hypertension. Its clinical, paraclinical and therapeutic aspects were the subjects of many studies worldwide [1-4]. Patients with idiopathic CTS may complain of paresthesias (prickling, itching, numbness and other abnormal sensations) of whole palmar surface of the hand, involving the sensory territory of the ulnar nerve [2,5-8] (Figure 1). This raises the hypothesis of a possible transfer of excessive pressure from the carpal tunnel to the Guyon canal, which could bring out an entrapment of the ulnar nerve [3,5,9]. Figure 1: Median and ulnar nerves sensory territories in the palmar surface of the hand. (Please note that TCL is both the roof of the carpal tunnel and the floor of Guyon's canal). This work was retrospective. Clinical and electrophysiological data of patients with unilateral or bilateral CTS confirmed by ENMG were collected. A period of three years (early 2010 until the end of 2012) was fixed. Only data of subjects with idiopathic CTS were retained, regardless of their age, gender, ethnic origins and professions. Thus, all those who had an history of systemic disorders predisposing to this disease (such as diabetes mellitus, hypothyroidism or chronic renal failure), an history or clinical signs of peripheral neuropathy, cervical radiculopathy or a trauma of upper limb including fractured wrist, were excluded from this study. 304 patients were retained. All of them were examined and recorded in the nervous system functional explorations department of Sahloul teaching hospital (Tunisia), by the same physician in order to guarantee the reliability and the reproducibility of the results. • Intra-individual: 43 unilateral and 261 bilateral CTS. • Inter-individual: Two groups of hands had been constituted from the whole of the 608 hands: “affected hands” with electrophysiological signs of CTS (n=565), and “healthy hands” with normal nerve conduction study (n=43). • Sensory nerve conduction velocity (SCV): respectively SCVm and SCVu. • Amplitude of sensory potential (ASP): respectively ASPm and ASPu. • Motor distal latency (MDL): respectively MDLm and MDLu. To highlight a possible correlation between the severity of CTS and the degree of repercussion on the parameters of the ulnar nerve, we used a local ectrophysiological CTS classification in 5 increasing severity stages, based on ENMG data. This classification, presented in Table 1, was inspired from Bland et al. graduation of CTS . 1 Minimal CTS Decreased SCVm and/or ASPm, with normal MDLm. 4 Severe Absent sensory response and elongated MDLm ≥ 6 ms.
5 Very severe Absent sensory and motor responses. Table 1: Comparison of clinical characteristics through day 7 and day 28. The same ENMG device, a Neuropack MEB-2200 K, manufactured by Nihon Kohden company (Japan), was used to record all patients. • For the sensory response, we stimulated the middle finger and collected the response on the anterior face of the wrist (Figure 2A). • The motor response was obtained by stimulating the median nerve in two points: a distal point on the anterior surface of the wrist, and a proximal point on the middle of the elbow crease. The motor potential was collected on the abductor pollicis brevis muscle (thenar eminence) (Figure 2B). • The sensory response was obtained by stimulating the fifth finger and collecting on the internal edge of the wrist frontal surface (Figure 2C). • The motor response was recorded by making a distal stimulation on the same point used for the collection of the sensory response, and a proximal one just below the internal epicondyle of the humerus. The collection was done on the abductor digiti minimi muscle (hypothenar eminence) (Figure 2D). SPSS software (version 20) was used to perform data entry and analysis. Pearson correlation was used to search significant correlation between the parameters of the median nerve and those of the ulnar one. Comparing averages of the NCS parameters was done using Student test. Significance was fixed at the 0.05 level . On the basis of established ENMG criteria, CTS was diagnosed in 304 patients (mean age: 45 years, range: 18-81 years). 93% of them were women. According to the calculated body mass index (BMI), 49% were obese (BMI > 30 Kg.m−2) and 35% had overweight (BMI > 25 Kg.m−2). Clinical complaints were bilateral in 79% of patients and asymmetric in 64% of cases. Nerve conduction study showed bilateral CTS in 86% of patients and was asymmetric (different electrophysiological stage) for 69% of them. ASP and SCV of ulnar nerve (ASPu, SCVu) of affected side were lower, in 65.1% of patients, than those of the opposite one. The MDL of ulnar nerve (MDLu) of the affected side was also more elongated, compared to the opposite one, in 65.1% of cases. However, the difference between the APSu of the two sides was significant (≥30% ) in only 32.1% of the cases and all ulnar NCS parameters were in normal standards. For the 209 patients suffering from bilateral CTS with predominant side (different electrphysiological stages), we compared ulnar NCS parameters of the two sides. We noted that ASPu and SCVu were lower in the more affected side for respectively 57.4% and 54.5% of patients. Moreover, the MDLu of the more affected side was more elongated than that of the opposite side in 52.1% of cases. 52 patients had bilateral CTS with the same electrophysiological stage in both hands. They were not included in the intra-individual study. This study concerned 608 hands (corresponding to 304 subjects) divided in two groups: “affected hands” (n=565) and “healthy hands” (n=43). In the affected hands group, the topography of paresthesias was localized in the sensory territory of the median nerve in 48.4% of cases, and in whole hand in 51% of cases. The remaining 1.6% concerned atypical presentations such as exclusive paresthesias in ulnar nerve sensory territory. In the same group, there was statistically significant positive linear correlation between ASPm and ASPu (r = 0.13, p<0.05) (Figure 3). However, no significant correlation was found between respectively SCVm and SCVu, MDLm and MDLu, MDLm and ASPu, and MDLm and SCVu. The comparison of ulnar NCS parameters averages of the two groups is summarized in Table 2, which shows that there saw significant difference for all parameters (ASPu, SCVu and MDLu). Abbreviations: SCVm: Sensory nerve conduction velocity of the median nerve. 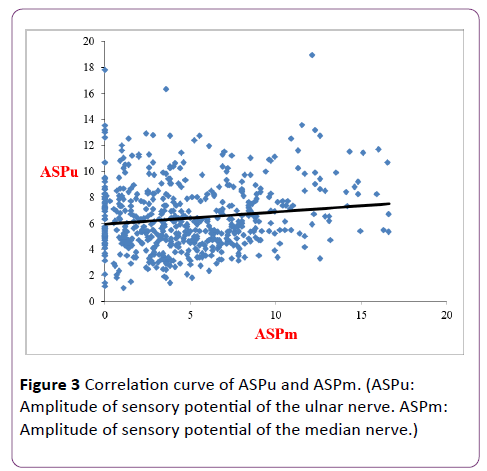 ASPm: Amplitude of sensory potential of the median nerve. MDLm: Motor distal latency of the median nerve. Table 2: Averages’ comparison of ulnar nerve NCS parameters between “affected hands” and “healthy hands” groups. 1. Based on our previously cited classification of CTS severity, in five increasing stages. The following distribution was found: stage 1 (29%, n=163 hands), stage 2 (56%, n=315), stage 3 (7%, n=40), stage 4 (7%, n=42), stage 5 (1%, n=5). The averages of ulnar NCS parameters of each stage were compared with those of “healthy hands” group. Statistically significant values were found for stages 1, 2 and 3 but not for stages 4 and 5 (Table 3). Changes of ulnar NCS parameters were more important in stage 2 than in stage 1. They were statistically significant for SCVu and MDLu (Table 4). Abbreviations: H: Average of the corresponding parameter in « healthy hands » group; n= number of hands;ms: millisecond; m/s: meter /second; μV: microvolt. Table 3: Morphological, physiological and biochemical characteristics of isolate BDCC-TUSA-12. Abbreviations: n=Number of hands; ms: millisecond; m/s: meter/second; μV: microvolt. Table 4 : Comparison of ulnar NCS parameters averages between stages 1 and 2 (local classification). 2. Based on another neurophysiological classification of CTS severity, proposed by Ginanneschi et al. . “Affected hands” group was divided in two stages: stage I defined as “abnormal SCVm and/or ASPm and normal MDLm”, n=163 (29%), and stage II defined as “abnormal SCVm and/or ASPm and elongated MDLm”, n=402 (71%). Changes of ulnar NCS parameters according to CTS severity degree was studied by comparing averages of ulnar NCS parameters in each stage with those of “healthy hands” group. The results are shown in Table 5. Changes of SCVu and MDLu were significantly more prominent in stage II than in stage I (Table 6). Table 5: Averages of ulnar NCS parameters in each CTS severity stage (Ginanneschi’s classification), in comparison with those of “healthy hands” group. Table 6: Comparison of ulnar NCS parameters averages between stages 1 and 2 (Ginanneschi’s classification). Finally, we sought to find any correlation between modification of ulnar NCS parameters and topography of paresthesias. Table 7 shows that in case of CTS with paresthesias restricted to median nerve territory (n=252), the averages of the sensory parameters of the ulnar nerve (ASPu These values were also decreased and statistically more significant when paresthesias extended to the ulnar nerve territory and thus covering the whole palmar surface of the hand (n=267). Moreover, the average of MDLu was significantly more elongated in hands with paresthesias in the only median territory compared to MDLu average of “healthy hands” group. This elongation becomes more significant when paresthesias affect the whole hand. When comparing ulnar nerve NCS parameters averages of the two groups of paresthesias’ topography, there were no significant differences. Abbreviations: H: average of the corresponding parameter in « healthy hands » group; n= number of hands; ms: millisecond; m/s: meter /second; μV: microvolt. Table 7: Variation of the averages of ulnar NCS parameters according to paresthesias’ topography. • The first one is that many patients with CTS, confirmed by an ENMG exam, complained clinically of paresthesias which were not limited to the sensory territory of the median nerve, but also reached the territory of the ulnar nerve. • The second one is that in some patients with idiopathic CTS, we have noted that ulnar nerve electrophysiological parameters (especially MDLu, ASPu and SCVu) tended to a change. The question was then: is there an impact of CTS on the ulnar nerve at the wrist? Population characteristics of the present study were similar to what is usually mentioned in CTS literature. This concerned especially mean age which was equal to 45 years [5,10], women predominance (93% of patients) [19-21], frequent obesity (49% had a BMI value beyond 30 kg.m−2) [21-24] and predominance of bilateral CTS (86% of patients) [25,26]. In addition, 51% of our patients had paresthesias at the whole palmar surface hand. Several other studies have also reported the same phenomenon during CTS with similar percentages [6,7,27]. Approximately two-thirds of patients with unilateral CTS had lower ASPu and SCVu and more elongated MDLu in the affected side compared to the opposite one. The difference between the APSu of the two sides were electrically significant, with reference to criteria set by Fournier , in 32.1% of the cases. Similarly, more than half of patients with bilateral CTS had lower ASPu and SCVu and more elongated MDLu in the predominant side. To our knowledge, no study had conducted similar comparison. The present study found a statistically significant positive correlation between ASPu and ASPm in CTS. Similar results were found by some authors [10,28,29]. However, there was no significant positive correlation between MDLu and MDLm, which was also noted by Ginanneschi et al. . Moreover, contrary to what has been reported in other studies [3,10,27,28], we did not detect correlations, neither positive nor negative, between other parameters, especially SCVu and SVCm , ASPu and SCVm , ASPu and MDLm [3,10,28], SCVu and MDLm [27,28] and sensory distal latency of ulnar nerve (SDLu) and MDLm . On the other hand, the present study showed statistically significant decrease in mean values of sensory parameters of the ulnar nerve (ASPu and SCVu) and increase of MDLu average in the group of affected hands in comparison with the corresponding values in the healthy hands’ group. Similar results were found by other authors both for sensory parameters of the ulnar nerve [3,10,27] and MDLu [10,28]. However, Azmy et al. found a non-significant difference between APSu averages of healthy and affected hands. In addition, Ginanneschi et al. have not noticed a significant difference for MDLu. They explain this result by a greater fragility of the sensory fibers than the motor ones, which resist more to nerve compression in case of CTS, thus preserving the motor NCS parameters of the ulnar nerve. 1. According to local classification of CTS. Significant correlation was found for stages 1, 2 and 3, but not for stages 4 and 5. However Ginanneschi et al. reported increasing ulnar sensory parameters’ changes when going from stage 2 to stage 5 [3,28], using a comparable classification . This difference of results could be explained by the difference of hands’ number and the age-mismatch of each stage in both studies. In order to avoid the bias of age, Ginanneschi et al. formed for each stage, a control group of healthy hands belonging to subjects of similar age range. 2. Using another CTS classification model with only two stages (I: moderate and II: severe), according to the elongation or not of MDLm, like proposed by Ginanneschi et al. . A significant correlation was found. Thus, the impact of CTS on ulnar parameters was significantly higher in stage II than in stage I, as well as these authors showed in their study. In another hand, even, the averages of ulnar nerve parameters were different between patients with whole hand paresthesias CTS and those with only median nerve territory paresthesias, these differences were not statistically significant. Similar results were noted in some other studies, but were statistically significant [27,32]. Furthermore, when comparing the averages of these parameters in each group (“whole hand” and “limited to median nerve territory” paresthesias) with the averages of the correspondent parameters in “healthy hands” group, statistically significant differences were found. These differences were more significant for the group “whole hand paresthesias”. Thus, the extension of paresthesias at the whole hand could express a greater impact of CTS on ulnar nerve, even if Tamburin et al. have reported opposite results. The hypothesis of a possible impact of CTS on the ulnar nerve [34,35] was based on a clinical observation. It consists in disappearance of paresthesias in the ulnar nerve territory after CTS surgical release [5,7]. In addition, Murata et al. noted that in case of associated idiopathic CTS and Guyon's canal syndrome, the only median nerve neurolysis can improve the symptoms in ulnar nerve territory. Thus, the first studies to investigate this hypothesis used clinical tests. In 1985, Silver et al. used two subjective validated tests: the "Two-point discrimination"  and the "Semmes-Weinstein monofilament"  tests. They found that 34% of patients with CTS had abnormalities in at least one of the two tests, in both median and ulnar sensory territories. In addition, they reported clinical improvement in the two territories, respectively in 86% for the "Two-point discrimination" test and in 94% in "Semmes-Weinstein monofilament" test, after surgical neurolysis of the median nerve . In 1990, Imai et al. studied the vibratory sensitivity of the index and the fifth digit, which are respectively innervated by sensory fibers of median and ulnar nerves. The authors found that 36% of hands with CTS had a high vibratory threshold in both fingers in comparison with control hands. The same hypothesis was investigated by some other authors [5,9,40] using ENMG exam. Indeed, Ginanneschi et al. demonstrated significant improvement of SCVu and ASPu six months after surgical release of CTS  and even after only one month for SCVu . Similar results concerning MDLu were noted by Green et al. . In another study, Ginanneschi et al. used the “stimulusresponse curves”, which is an unusual electrophysiological test reflecting the recruitment level of motor axons . They found that the ulnar curve closely followed the median one in both moderate and severe CTS. Indeed, they noted a drop of curves’ slopes for both median and ulnar nerves, which was especially important when CTS is severe. In another study using the same electrophysiological test, Ginanneschi et al. , noted postoperative improvement of the recruitment rate for both motor and sensory axons of the ulnar nerve, in comparison to preoperative rates. Another original method consisted in investigating NCS parameters of the dorsal cutaneous branch of the ulnar nerve, which do not cross the Guyon’s tunnel . The authors found that these parameters don’t change in CTS group in comparison to controls. 1. Measurement of the intraductal pressure in the carpal and the Guyon's tunnels. Ablove et al. and Okutsu et al. were able to demonstrate a significant decrease of pressure at the two tunnels after surgical treatment of CTS by sectioning the TCL, using an angiocatheter inserted at the wrist and directly joined to a pressure monitor. This can be explained by the fact that carpal and Guyon's tunnels are contiguous at the wrist. Indeed, the transverse carpal ligament (TCL) is both the roof of the carpal tunnel and the floor of Guyon's canal , in such a way that in case of CTS, the high pressure in the first canal spreads progressively to the second one, causing significant morphological and functional impairment of the ulnar nerve [11,12]. 2. Morphological examinations of the wrist (ultrasound and MRI). Ultrasound was used by Ginanneschi et al. . They noted that the cross-sectional area of the ulnar nerve at the Guyon's channel increased significantly 6 months after TCL section in comparison to its preoperative measurements. They also reported that cross-sectional area’s shape changed from a flat form during CTS, to an oval configuration after surgical release. 3. Other researchers have used MRI and demonstrated that the Guyon’s channel, which had a triangular shape with a radial direction before surgery, turned to take rounded  or oval shape with a longer dimension in the palmodorsal direction  after CTS release. These morphological changes could be an argument to explain functional postoperative improvement of the ulnar nerve . Finally, according to the results of the present study, and after a large review of international literature, it may seem evident that CTS can cause an impact on the ulnar nerve at wrist. However, some authors, like Moghtaderi and Ghafarpoor , reported opposite results using electrophysiological arguments, and rejecting any association between CTS and ulnar nerve compression at the wrist. They tried to explain their results implicating different racial groups and dissimilar NCS techniques and cutoff values in comparison with other studies. More recently, in 2015, Kang et al. reported conflicting results between morphological and functional arguments. Indeed, they found significant ultrasonographic changes of cross-sectional areas of ulnar and median nerves in the wrist in case of CTS, but no significant correlation between their respective NCS parameters. In the same year, Eom et al. reported exactly the opposite findings. Most authors who conducted similar studies compared the parameters of the ulnar nerve in affected hands with reference standards used in daily practice [7,9,10,34,35]. This could be a methodological error since there is a great variability of these parameters in normal subjects, especially according to the height and the recording conditions such as skin temperature. Thus, the comparison of ulnar NCS parameters between the two hands of the same subject provides greater objectivity and reliability of the results. The present work has the merit of having carried out an intra-individual study for the first time. It consisted in comparing affected and healthy hands in case of unilateral CTS, and most and less affected hand in case of bilateral CTS with predominant side. However, to confirm the impact of CTS on the ulnar nerve, both structurally and functionally, it was better to confront patient's ENMG data to those of other types of explorations. This was unfortunately not possible since our study was retrospective and complementary investigations were not realized for the majority of the patients. Thus, a prospective study would have a larger contribution, not only to better characterize this impact, but also to monitor unlar NCS parameters after treatment, especially after surgical neurolysis. In patients with CTS, postoperative improvement of symptoms, stimulation tests  and electrophysiological abnormalities  of the ulnar nerve, appears to be the result of pressure’s drop in Guyon's lodge  that follows the same phenomenon in the carpal tunnel. Hence, even if paraesthesias affect the whole hand and/or electrophysiological changes of the ulnar nerve are obvious, a simultaneous decompression of the Guyon's channel during surgical carpal tunnel release seems to be useless [7,9]. According to some authors [2,3], by analogy to functional abnormalities of the median nerve in cases of moderate CTS, the ulnar nerve may present an Na+/K+ pump dysfunction causing functional disorders and nerve conduction changes, rather than lesional disorders (alteration of the myelin sheath in particular). This is even more likely since these changes are rapidly reversible after surgical release of CTS. Regarding to sensory extension of paresthesias to ulnar nerve territory, some authors have pointed out that maintaining the membrane potential of sensory afferent fibers is much more dependent on Na+/K+ pump activity than for motor axons [46-48]. Thus, the spread of high pressure from carpal to Guyon’s tunnel could disrupt the functioning of Na+/K+ pump in sensory fibers of the ulnar nerve which could clinically be expressed by paresthesias in its territory. On another hand, Ginanneschi et al. [2,3] indicate that paresthesias extension to the ulnar territory may be due, at least in part, to plastic changes of cortical representation of the hand at the sensory cortex. Indeed, Tecchio et al. reported a wider representation of the hand at the sensory cortex in patients suffering from CTS complaining of paresthesias of the whole hand. This increased representation could be related to a peripheral deafferentation of the median nerve territory which contributes to the spread of paresthesias to the whole hand [2,33]. In conclusion, the present study was based on clinical and electrophysiological findings we made during our daily practice, suggesting an impact of CTS on ulnar nerve. Our results, showed significant changes in ulnar NCS parameters in comparison with a control group of healthy hands. These changes were more important when CTS was severe and when paresthesias reached the ulnar nerve sensory territory. Despite these changes are within the standard norms, this could argue in favor of possible impact of CTS on the ulnar nerve. To explain this, transfer of high pressure from carpal tunnel to Guyon’s one was widely evoked . We defend the hypothesis of functional disorders, especially local Na+/K+ pump dysfunction  at the expense of the hypotheses of axon/myelin lesions or changes of the hand representation at the sensory cortex, since there is a rapid clinical, electrophysiological and morphological back to normal of ulnar nerve after surgical release of CTS [5,9,11,12,40]. Burton CL, Chesterton LS, Chen Y, Van der Windt DA (2016) Clinical course and prognostic factors in conservatively managed carpal tunnel syndrome: A systematic review. Archives of physical medicine and rehabilitation5:836-852. Ginanneschi F, Dominici F, Milani P, Biasella A, Rossi A (2007) Evidence of altered motor axon properties of the ulnar nerve in carpal tunnel syndrome. Clinical neurophysiology: official journal of the International Federation of Clinical Neurophysiology118:1569-1576. Ginanneschi F, Milani P, Mondelli M, Dominici F, Biasella A, et al. Ulnar sensory nerve impairment at the wrist in carpal tunnel syndrome. Muscle & nerve 37:183-189. Raja S, Carlos AJ (2015) Carpal tunnel syndrome–current controversies. Orthopaedics and Trauma. 29:273-277. Ginanneschi F, Filippou G, Reale F, Scarselli C, Galeazzi M, et al. (2010) Ultrasonographic and functional changes of the ulnar nerve at Guyon's canal after carpal tunnel release. Clinical neurophysiology: official journal of the International Federation of Clinical Neurophysiology121:208-213. Gupta SK, Benstead TJ (1997) Symptoms experienced by patients with carpal tunnel syndrome. The Canadian Journal of Neurological Sciences Le journal canadien des sciences neurologiques24:338-342. Silver MA, Gelberman RH, Gellman H, Rhoades CE (1985) Carpal tunnel syndrome: associated abnormalities in ulnar nerve function and the effect of carpal tunnel release on these abnormalities. The Journal of Hand Surgery 10:710-713. Smith IS, Naeem M (1996) The presentation of carpal tunnel syndrome. Electroencephalography and Clinical Neurophysiology99:18. Mondelli M, Ginanneschi F, Rossi A (2009) Evidence of improvement in distal conduction of ulnar nerve sensory fibers after carpal tunnel release. Neurosurgery 65:696-700. Sedal L, McLeod JG, Walsh JC (1973) Ulnar nerve lesions associated with the carpal tunnel syndrome. Journal of Neurology, Neurosurgery, and Psychiatry36:118-123. Ablove RH, Moy OJ, Peimer CA, Wheeler DR, Diao E (1996) Pressure changes in Guyon's canal after carpal tunnel release. Journal of Hand Surgery (Edinburgh, Scotland) 21:664-665. Okutsu I, Hamanaka I, Yoshida A (2009) Pre- and postoperative Guyon's canal pressure change in endoscopic carpal tunnel release: correlation with transient postoperative Guyon's canal syndrome. The Journal of Hand Surgery, European volume34:208-211. Lee CH, Kim TK, Yoon ES, Dhong ES (2005) Postoperative morphologic analysis of carpal tunnel syndrome using high-resolution ultrasonography. Annals of Plastic Surgery54:143-146. Eom YI, Choi MH, Kim YK, Joo IS (2015)Sonographic findings in the ulnar nerve according to the electrophysiologic stage of carpal tunnel syndrome. Journal of ultrasound in medicine: official journal of the American Institute of Ultrasound in Medicine34:1027-1034. 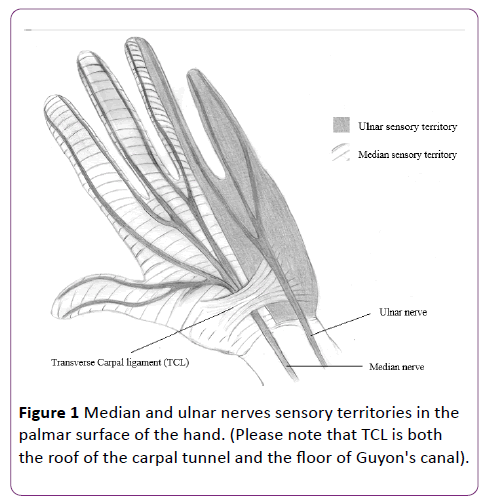 Kang S, Yang SN, Yoon JS, Kang HJ (2016) Effect of carpal tunnel syndrome on the ulnar nerve at the wrist: Electrophysiologic and ultrasonographic studies. Clinical Neurophysiology127:e89. Bland JD (2000) A neurophysiological grading scale for carpal tunnel syndrome. Muscle & nerve23:1280-1283. Greenland S, Senn SJ, Rothman KJ, Carlin JB, Poole C, et al. (2016) Statistical tests, P values, confidence intervals, and power: a guide to misinterpretations. European Journal of Epidemiology31:337-350. EF. Atlas d’électromyographie. 2ème éditioned: Lavoisier, Paris; 2013 04/2013 12 p.
Becker J, Nora DB, Gomes I, Stringari FF, Seitensus R, et al. (2002) An evaluation of gender, obesity, age and diabetes mellitus as risk factors for carpal tunnel syndrome. 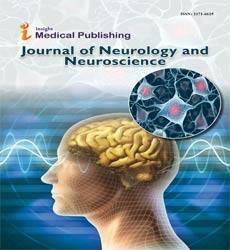 Clinical neurophysiology : official journal of the International Federation of Clinical Neurophysiology113:1429-1434. Ryhcpcmngkjlpvaielag M (2005) Surveillance en population générale du syndrome du canal carpiendans le Maine-et-Loire en 2002 et 2003. 44-45:221-224. Tanaka S, Wild DK, Cameron LL, Freund E (1997) Association of occupational and non-occupational risk factors with the prevalence of self-reported carpal tunnel syndrome in a national survey of the working population. American Journal of Industrial Medicine 32:550-556. Hlebs S, Majhenic K, Vidmar G (2014) Body mass index and anthropometric characteristics of the hand as risk factors for carpal tunnel syndrome. Collegium antropologicum38:219-226. Karpitskaya Y, Novak CB, Mackinnon SE (2002) Prevalence of smoking, obesity, diabetes mellitus, and thyroid disease in patients with carpal tunnel syndrome. Annals of Plastic Surgery 48:269-273. Roquelaure Y, Mariel J, Dano C, Fanello S, PenneauFD (2001) Prevalence, incidence and risk factors of carpal tunnel syndrome in a large footwear factory. International Journal of Occupational Medicine and Environmental Health 14:357-367. Barcenilla A, March LM, Chen JS, Sambrook PN (2012) Carpal tunnel syndrome and its relationship to occupation: a meta-analysis. Rheumatology (Oxford, England51:250-261. Tay LB, Urkude R, Verma KK (2006) Clinical profile, electrodiagnosis and outcome in patients with carpal tunnel syndrome: a Singapore perspective. Singapore Medical Journal47:1049-1052. Yemisci OU, Yalbuzdag SA, Cosar SN, Oztop P, Karatas M (2011) Ulnar nerve conduction abnormalities in carpal tunnel syndrome. Muscle &Nerve44:352-357. Ginanneschi F, Milani P, Rossi A (2008) Anomalies of ulnar nerve conduction in different carpal tunnel syndrome stages. Muscle &Nerve38:1155-1160. Kiylioglu N, Akyildiz UO, Ozkul A, Akyol A (2011) Carpal tunnel syndrome and ulnar neuropathy at the wrist: comorbid disease or not? Journal of clinical neurophysiology: official publication of the American Electroencephalographic Society28:520-523. Azmy RM, Labib AA, Elkholy SH (2013) Axonal degeneration of the ulnar nerve secondary to carpal tunnel syndrome: fact or fiction? Neural Regeneration Research 8:1418-1422. Padua L, LoMonaco M, Gregori B, Valente EM, Padua R, et al. (1997) Neurophysiological classification and sensitivity in 500 carpal tunnel syndrome hands. ActaNeurologicaScandinavica96:211-217. Vahdatpour B, Raissi GR, Hollisaz MT (2007) Study of the ulnar nerve compromise at the wrist of patients with carpal tunnel syndrome. Electromyography and Clinical Neurophysiology47:183-186. Tamburin S, Cacciatori C, Praitano ML, Marani S, Zanette G (2009) Ulnar nerve impairment at the wrist does not contribute to extramedian sensory symptoms in carpal tunnel syndrome. Clinical neurophysiology: official journal of the International Federation of Clinical Neurophysiology120:1687-1692. Cassvan A, Rosenberg A, Rivera LF (1986) Ulnar nerve involvement in carpal tunnel syndrome. Archives of Physical Medicine and Rehabilitation67:290-292. Gozke E, Dortcan N, Kocer A, Cetinkaya M, Akyuz G, et al. (2003) Ulnar nerve entrapment at wrist associated with carpal tunnel syndrome. Neurophysiologieclinique = Clinical Neurophysiology33:219-222. Murata K, Shih JT, Tsai TM (2003) Causes of ulnar tunnel syndrome: a retrospective study of 31 subjects. The Journal of Hand Surgery 28:647-651. Dellon AL (1978) The moving two-point discrimination test: clinical evaluation of the quickly adapting fiber/receptor system. The Journal of Hand Surgery 3:474-481. Bell KJ, Tomancik E (1987) The repeatability of testing with Semmes-Weinstein monofilaments. The Journal of Hand Surgery 12:155-161. Imai T, Matsumoto H, Minami R (1990) Asymptomatic ulnar neuropathy in carpal tunnel syndrome. Archives of Physical Medicine and Rehabilitation71:992-994. Green TP, Tolonen EU, Clarke MR, Pathak P, Newey ML, et al. (2012) The relationship of pre- and postoperative median and ulnar nerve conduction measures to a self-administered questionnaire in carpal tunnel syndrome. NeurophysiologieClinique = Clinical Neurophysiology42:231-239. Ginanneschi F, Mondelli M, Dominici F, Rossi A (2006) Changes in motor axon recruitment in the median nerve in mild carpal tunnel syndrome. Clinical neurophysiology: official journal of the International Federation of Clinical Neurophysiology117:2467-2472. DakhilJF, Ikram MS, Schreuder F (2008) Delayed onset ulnar nerve palsy and carpal tunnel syndrome following blunt injury to the wrist. Injury Extra39:239-242. Ablove RH, Peimer CA, Diao E, Oliverio R, Kuhn JP (1994) Morphologic changes following endoscopic and two-portal subcutaneous carpal tunnel release. The Journal of Hand Surgery 19:821-826. Richman JA, Gelberman RH, Rydevik BL, Hajek PC, Braun RM, et al. (1989) Carpal tunnel syndrome: Morphologic changes after release of the transverse carpal ligament. The Journal of Hand Surgery 14:852-857. Moghtaderi A, Ghafarpoor M (2009) The dilemma of ulnar nerve entrapment at wrist in carpal tunnel syndrome. Clinical Neurology and Neurosurgery111:151-155. Burke D (2007) The properties of axons differ according to their function. The Journal of Physiology578:1-2. Burke D, Kiernan MC, Bostock H (2001) Excitability of human axons. Clinical neurophysiology: Official Journal of the International Federation of Clinical Neurophysiology112:1575-1585. Kiernan MCBD, Bostock H (2005) Nerve excitability measures: Biophysical basis and use in the investigation of peripheral nerve disease. Pj D, (ed): Elsevierpp: 113-129. Tecchio F, Padua L, Aprile I, Rossini PM (2002) Carpal tunnel syndrome modifies sensory hand cortical somatotopy: A MEG study. Human Brain Mapping 17:28-36.